Stroll through the multiple gardens, myriad distractions, and massive live oaks at Hermann Park in the Houston Museum District. Nestled between the sprouting skyscrapers of the Medical Center and the ever-expanding collections of the Museum District lies the sprawling 445 acres of Hermann Park. Serving six million annual visitors, the century-old park is packed with a recreational lake, gardens, a railroad, and several miles of walking paths that wind around a plethora of picnic spaces. An 18-hole golf course and the Houston Zoo also rest inside the park’s boundary, offering even more to do during a day’s visit to the idyllic green spaces of Hermann Park. 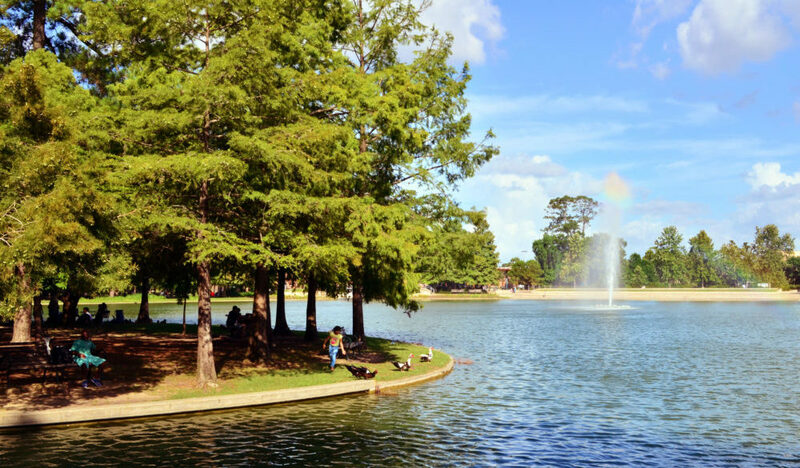 Grasping the park’s largesse can be challenging if it’s your first time visiting, so take a moment to familiarize with the family-friendly Hermann Park and maximize your afternoon of fun. When choosing how to arrive at Hermann Park, it’s useful to know your options so you can navigate peak hours like a pro. Along Hermann Park Drive, there are several surface lots at the center of Hermann Park that provide the most direct access into the park and the Houston Zoo. That also means that when the zoo is at it’s busiest, parking is at its scarcest. During these times, you might find a few spots at the nearby McGovern Centennial Gardens (as well as another worthwhile park experience) or you can brave the adjacent roundabouts to find additional, if small, parking lots. The parking crunch might most impact your visit on summer mornings and every weekend of the year, though a stressless route to Hermann Park exists using the MetroRail. The Red Line stations at “Hermann Park/Rice University” and “Memorial Hermann Hospital/Houston Zoo” provide access to the north and south ends of the park, respectively. Houston’s B-Cycle stations are also a great option for arriving to Hermann Park, with plenty of bike rentals available in the surrounding Museum District and Rice University areas. For the shortest route into the park, try hopping on a BCycle outside of The Health Museum or Centennial Gardens and riding it to the Hermann Park station on the edge of the central parking lots. First stop from the parking lots is Kinder Station, an area that boasts the Hermann Park Conservancy Gift Shop and serves as the central station for the Hermann Park Railroad. 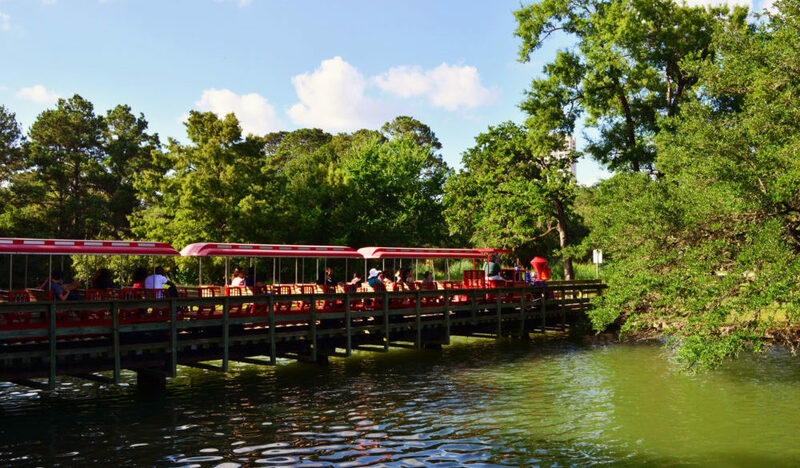 A fantastic way to tour Hermann Park, the railroad winds through each major area of the park; Miller Outdoor Theatre, the Mary Gibbs and Jesse H. Jones Reflection Pool, around the Japanese Garden, the Buddy Carruth Playground For All Children, and along McGovern Lake. Chugging along its two-mile track daily from 10am to 6pm, the railroad offers riders a great perspective of Hermann Park in a relaxing twenty minute ride. Tickets to depart from Kinder Station cost $3.50 per person, though you’re welcome to hop on for free at either of the other two stops around the park, space permitting. You’ll find these stations serving the north and west ends of Hermann Park; MD Anderson Station lies just outside Miller Outdoor Theatre and a station at the Buddy Carruth Playground also provides convenient access into the Medical Center at Fannin Street and Cambridge. Beyond Kinder Station, visitors find themselves at the edge of McGovern Lake. 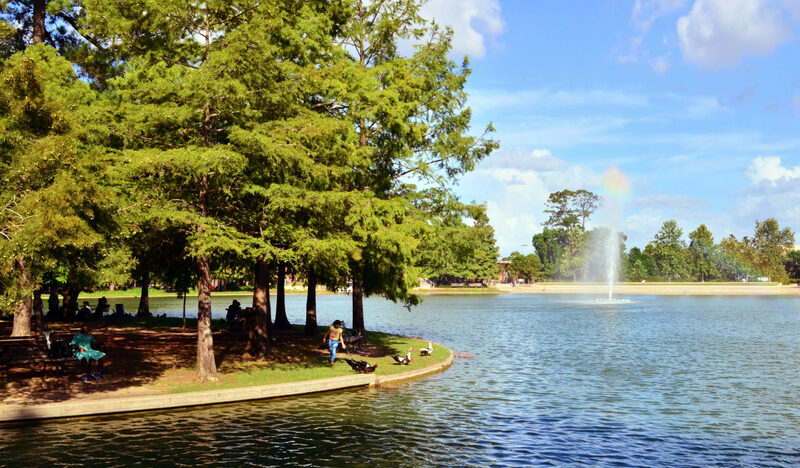 This recreational water feature encompasses eight acres on the south end of Hermann Park, crowned by a central fountain gushing dozens of feet into the air. Here, the ever-popular pedal boats send up to four riders around the lakefront, offering up unique views of McGovern Lake and the surrounding plaza. A half hour of boat access can be purchased for $11 at the Kinder Station Gift Shop from 10am to 5pm. When hunger strikes, the Pinewood Cafe serves up satisfying fare from breakfast sandwiches, to salads, burgers, and a build-your-own grilled cheese alongside scenic views of McGovern Lake. 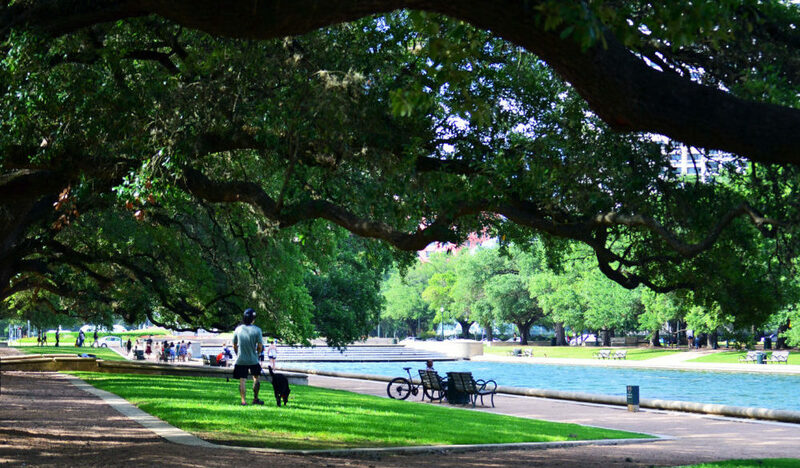 More picturesque views await along the west walking path, dotted with dozens of lakefront benches and picnic areas under the softly swaying shade of Hermann Park’s live oaks. Around McGovern Lake, you’ll find areas like these that make for prime lakeside picnics, serene spots for reading, and even catch-and-release fishing along the banks (restricted to ages 12 and under, 65 and over). On the west side of McGovern Lake, take a moment to explore this southwest corner of the park and find the Buddy Carruth Playground for All Children. 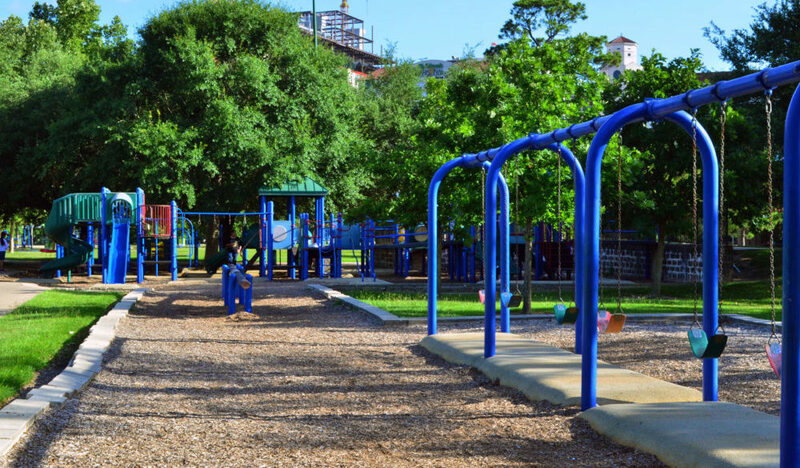 This area of Hermann Park features multiple age-appropriate play areas, pavilions perfect for parties, and a small splash pad that makes for a great way to cope with summer heat. A compact toddler area is blanketed by low-to-the-ground play equipment and a few small structures to explore. For the child more sure on their feet, a set of swings, spring riders, play structures, and sandbox are provided. Even bigger kids can zoom around on zip lines, bridges, slides, and more. The multiple pavilions, bathrooms, and picnic areas make this area an excellent spot for birthday parties and other gatherings. If you’d like to rent one of these spaces within Hermann Park, reservations can be made online. 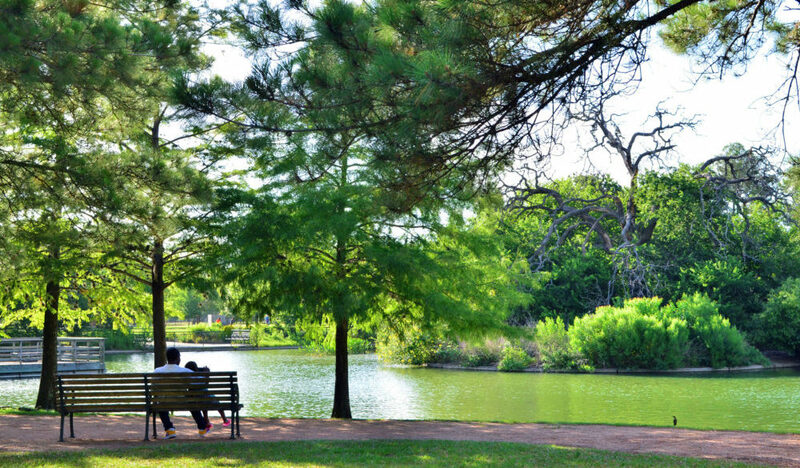 North of McGovern Lake and the Carruth playground, one of the highlights of Hermann Park invites all to experience a moment of tranquility. 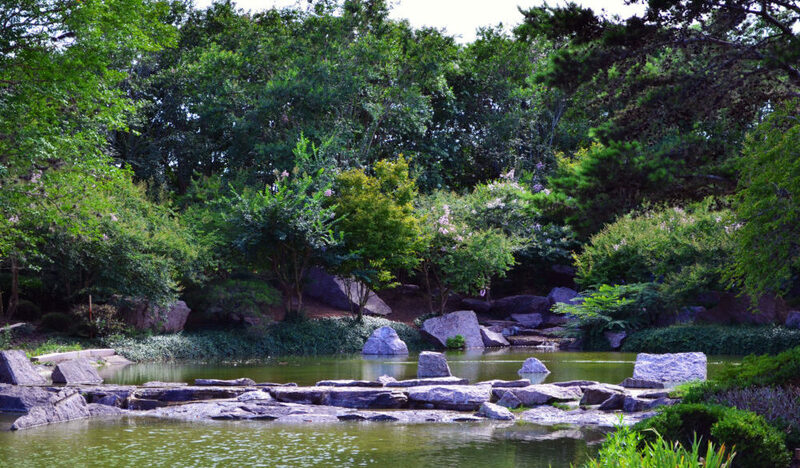 For over 25 years, the steady babbling of water and lush greenery of the Japanese Garden has transported visitors into one of the most serene and beautiful areas in all of Houston. Designed by world-renowned landscape architect Ken Nakajima, the gardens set visitors on winding paths lined with many native plants from crepe myrtles to Japanese maples, cherry trees, and wisteria. Inside the Japanese Garden, visitors stumble upon views meant for postcards. Small hills help to lift sight-lines and allow for beautiful outlooks over rock formations and ponds that serve as habitats for koi fish and turtles. Along the branches of pathways, it’s not difficult to find secluded benches or a quiet gazebo that invites reflection under the gently rustling trees stretching many feet into the air. 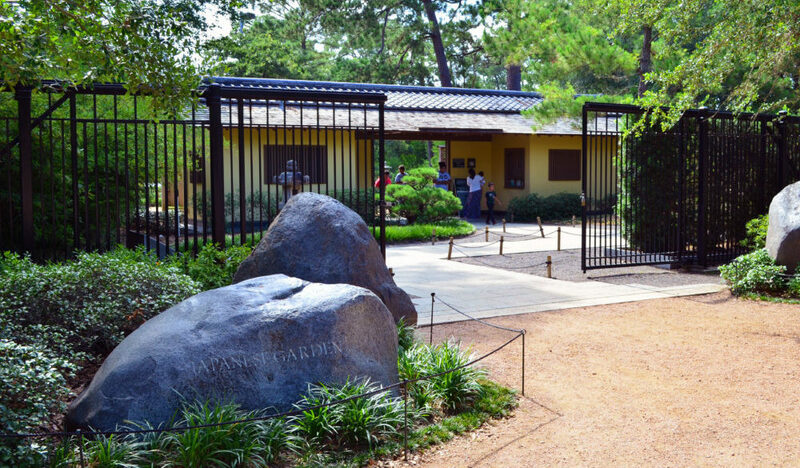 A must-see during a visit to Hermann Park, the Japanese Garden is open daily from 9am to 6pm. Outside the Japanese Garden, park-goers are surrounded by multiple rows of mature live oak trees that stretch their branches to cover most of this broad gravel path. Benches and seating areas fill the wide walking paths along both sides of the massive reflection pool that divides the north end of Hermann Park in half. 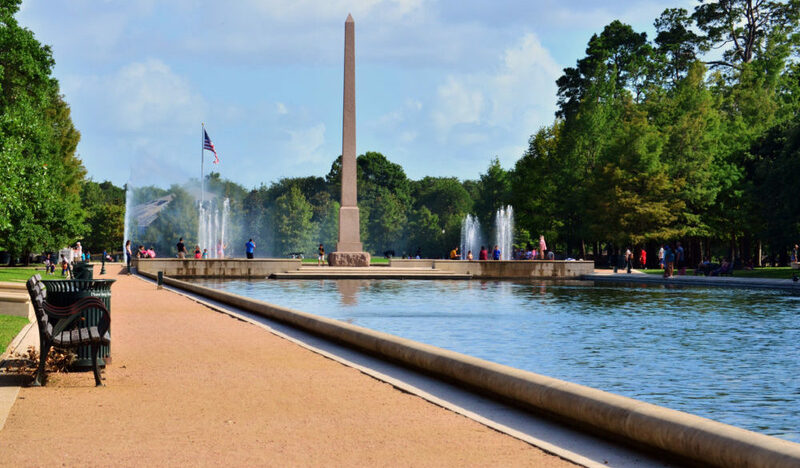 The Mary Gibbs and Jesse H. Jones Reflection Pool extends 740 feet from the edge of McGovern Lake to a bronze statue of Sam Houston, lined with benches that offer a respite in one of the busiest areas of the park. Walking through this area might also mean making friends with some of the local residents; families of ducks and turtles can be found wading through the reflection pool and occasionally along paths in search of food. On the south end, the Molly Ann Smith Plaza features four corners of gushing water fountains, mounted by the Pioneer Memorial Obelisk. This distinctive spire was placed at Hermann Park in 1936 to celebrate the centennial of Texas Independence. The close-by lake overlook rounds out a stop by the reflection pool, with seating areas that not only offer scenic McGovern Lake views, but also a chance to feel the wind-blown mist from the lake’s central fountain. Following the reflection pool north, across the Hermann Park Drive roundabout, you’ll find the bronze sculpture of Texas General Sam Houston mounted on his horse, Saracen, atop a granite archway. 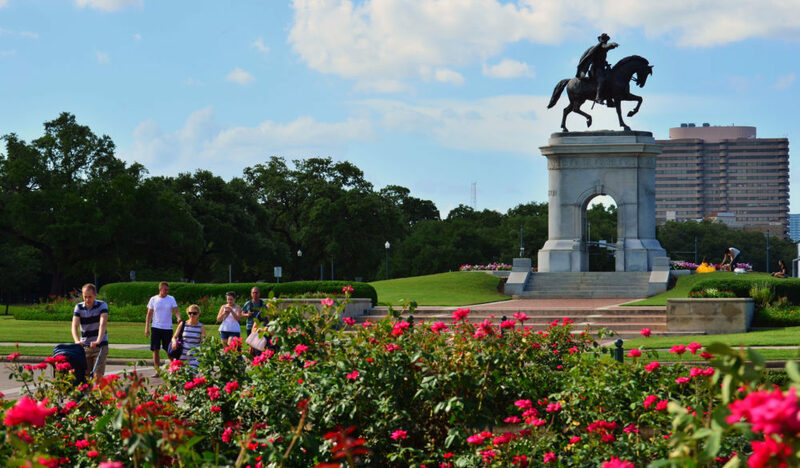 Placed at the entry of the park in 1925, the popular statue helps to align Hermann Park with Montrose Boulevard, while providing views of the reflection pool as well as the Mecom Fountain. This also serves as an excellent entry point into the Museum District, as it’s located across the street from the Houston Museum of Natural Science. Wedged between the reflection pool and Miller Outdoor Theatre, there is an area of Hermann Park that provides yet more sprawling fields and seating areas prime for rest and relaxation. This eastern portion of Hermann Park is well accommodating to groups looking for picnic tables or a grassy field to stretch out over blankets. Here, sunbathers share the park with family gatherings and kids playing catch. 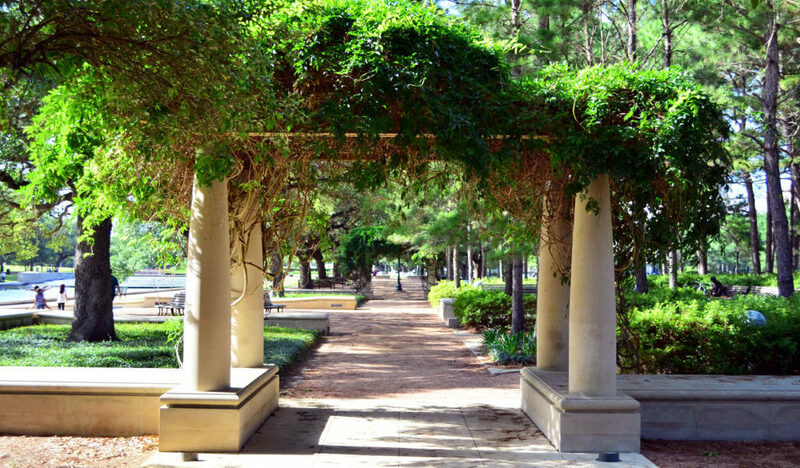 The tree-lined walkways provide more seating to Hermann Park visitors as well as guiding them into the beautifully green and shaded O. Jack Mitchell Garden. This spot sits close to the reflection pool but offers substantially more shade for those trying to duck away from the heat. Opened in 1923, Miller Outdoor Theatre provides free programming throughout the year including musicals, special ballet and Houston Symphony events, and touring artists winding through extensive catalogs of hits. From the eastern part of Hermann Park, it doesn’t take much effort to find Miller Outdoor Theatre. First, there’s the unmissable hill. The ground gradually, then steeply, lifts up several dozen feet into the air, providing some of the best outdoor seating in any of Houston’s well-attended venues (not to mention top-tier tumbling opportunities for brave children). Here, the lawn is always free and on any given night’s performance, you’ll find families with picnic baskets and coolers in tow, covering the hill with blankets. The seated area below is covered and free as well, though admission requires a ticket that can be obtained online or at the nearby box office. A schedule of events for Miller Outdoor Theatre can be found on their website. If you’re wrapping up your visit on this eastern end of Hermann Park, you’re a short walk away from the central parking lots to the southeast. For those that need to get back to the Metro Rail, hopping on the Hermann Park Railroad at the nearby MD Anderson Station is a free and fast way to cross back to the Carruth Playground and nearby Metro Rail stations. 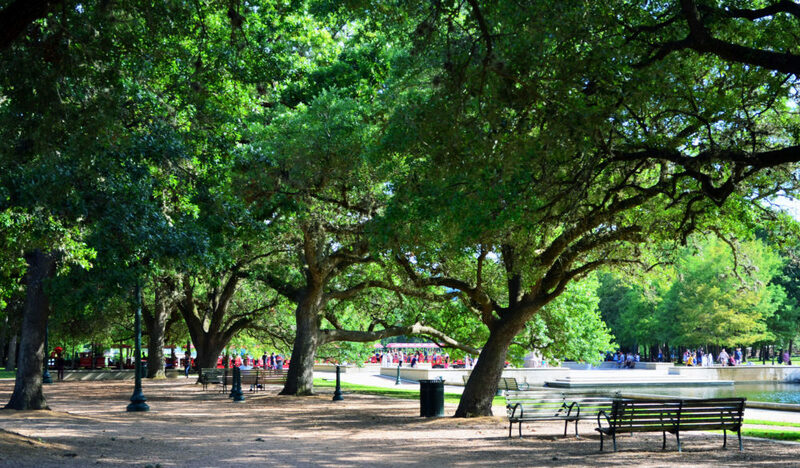 Hermann Park’s central location in Houston makes it an ideal starting point to any number of major institutions around the city. From here, you’re a quick walk to the Houston Museum of Natural Science, the McGovern Centennial Gardens, Hermann Park Golf Course and Historic Clubhouse, and the Houston Zoo, among many other popular locations. Festivals are also a popular sight in Hermann Park. The annual Kite Festival in March and Japanese Festival in April make for exciting, new ways to see the vast park. Keep an eye on the Hermann Park calendar for these and other smaller events taking place throughout the year. The Hermann Park Conservancy also provides online guides for visiting the park geared towards different interests from fitness to romance. A Points of Interest guide also provides information on many of the small and overlooked things that make Hermann Park special. Pets are welcome in Hermann Park, though they are not allowed on the Hermann Park train and pedal boats, or in the Houston Zoo and buildings within the park. Riding the Metro Rail to Hermann Park costs $1.25 one-way. A Red Line schedule can be found online at Metro Rail’s website. BCycle rentals cost $3 for thirty minutes, with the ability to rent for longer at kiosk stations. Check out their website for answers to frequent questions. Parking: Free parking available at central lots on Hermann Park Drive. Overflow parking at McGovern Centennial Gardens and metered parking available on surrounding Museum District streets. Click here for a detailed parking map.